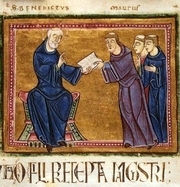 Benedict of Nursia (Italian: San Benedetto da Norcia) (c. 480 – 21 March 543 or 547) is a Christian saint, honored by the Catholic Church as the patron saint of Europe and students. Saint Benedict is currently considered a "single author." If one or more works are by a distinct, homonymous authors, go ahead and split the author. Saint Benedict is composed of 29 names. You can examine and separate out names.